Here in Oxford, we tried sowing some Kale in the middle of August. We sowed some directly into pots and as an after thought sowed some directly into the ground. Going on holiday for two weeks after sowing seeds is always asking for trouble, and by the time we got back they had shriveled up and were only good for the compost heap. However, the seeds sown direct into the ground did quite well. A few got eaten by slugs but a couple grew fast enough to escape their clutches. The location in the garden wasn’t the best, with shade from Conifer and other trees limited the amount of direct sun, as Autumn progressed, they were lucky to get one hour of sun per day. Yet, despite little direct sunlight, they kept growing and soon started to encroach on each other. We started picking some leaves from the bottom of the plants and got a few meals out of them. As the nights shortened, growth slowed down almost to a stop and the Kale pests seemed to be taking out more than they were able to grow. I think later damage came from pigeons or the like, it doesn’t look like the work of slugs – too big and neat. 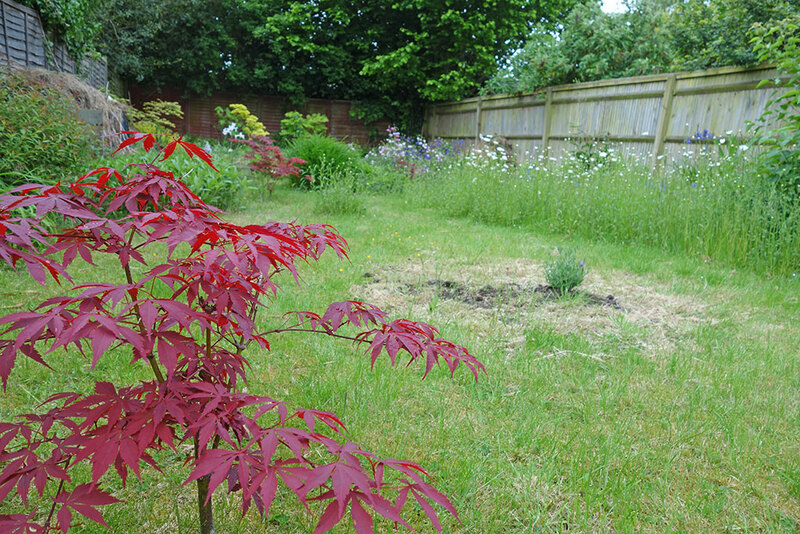 Anyway, they look OK, in the mostly empty border and were a good ground-cover as we await a new fence. The last few straggly plants will be harvested and will make the odd meal or two. But, for late sowing, they didn’t get enough sunlight to really get going – even the richest soil can’t compensate for lack of light. But, next year, we’ll pick a better spot and hope that they really take off. We may also try a later sowing because Kale is a good plant for providing fresh veg through the winter months. However, we may have to take pest control a bit more seriously which will mean netting to stop both butterflies and pigeons – so maybe not in the flower border. 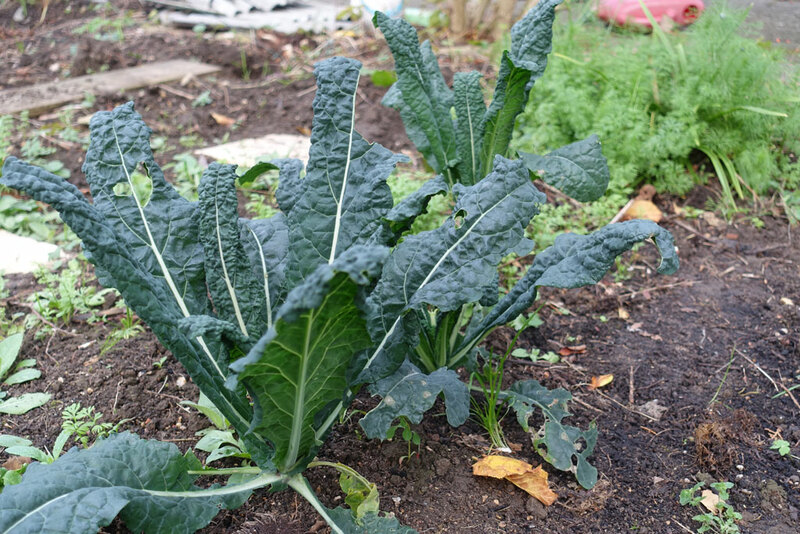 Here’s a useful post on growing organic Kale. Broad leaved trees produce prodigious volumes of leaves in Autumn. Their leaves should be composted or rotted separately to other garden waste. They can take upto 2 years to decompose properly. It is worth persevering because they make an excellent soil conditioner. The leaves will decompose in punctured plastic bags or a custom made leaf bin. Often these custom made leaf composters are made with a simple wire mesh. The advantage of using open bins is that they enable worms to enter and help the process of decomposition. It is important to have 2 bins / bags on the go at the same time, as they will not be ready in less than 1 year. It is possible to buy a special liquid which helps to speed up the process of decomposition. These accelerators are worth adding as they will speed up the process. Basically, these accelerators help add nitrogen to the leaves. If you have access to manure adding it to leaves will work very effectively. Even accelerated decomposition will not increase the nutritional value. Oak Chestnut and conifer leaves take far longer to rot down than others. I keep leaves as separate as is practical as my Acers rot quickly and can be used around my Rhododendrons to good effect. If you don’t want to wait 2 years to decompose leaves, you can simply add them at the bottom of a trench and then add soil, they will naturally disintegrate over time. Worms are crucial to the decomposition and are also good for your soil conditioning. It is far better to collect the leaves than leave them on your lawn. Rake your leaves together into a pile. Bits of soil, grass and a variety of leaves are not a problem but make the pile predominantly leaves. Put the leaves in a wire cage cover and leave to rot. alternatively put the leaves into a large plastic bag and puncture to allow air to enter. Leaves should be damp and can be lightly watered but not left soggy. The rotting will not create heat like normal compost and decomposition will be slow. The volume of leaf mold will be a tenth of the leaf pile you started with. Conifers and evergreen leaves will take three years to compost and are best added in small quantities. Shredding leaves or chopping with a lawnmower first helps to speed up composting. The purple Cosmos also add a dash of colour to this autumnal scene. 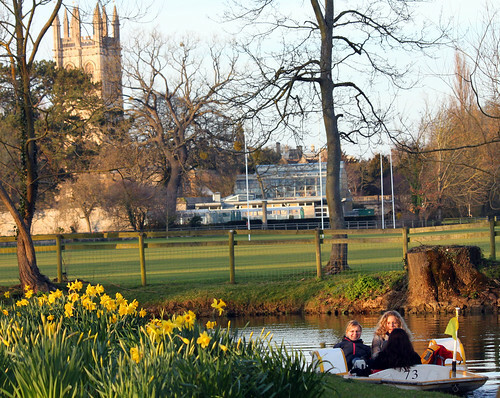 These photos are from Magdalen College Oxford University. Mother’s day in the UK is fast approaching. If you have a habit of forgetting until the last minute, you can always rely on a bunch of flowers to save the day. But, rather than just a standard bunch of daffodils from the petrol station, what else would make your mother really happy and inspired to bake you more cakes? Narcissus Tazetta. 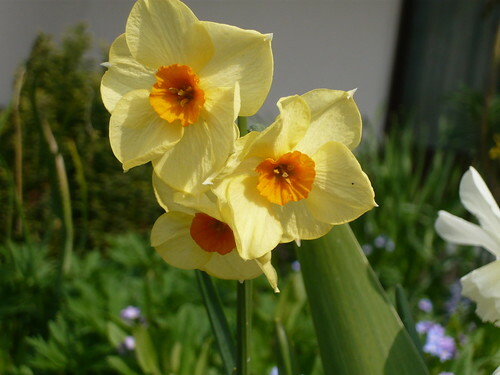 A late flowering daffodil. Warm spring has brought it out down here in Oxford. A lovely delicate flower with lovely colour contrast. A simple single colour Petunia gives a good effect. The typical plants seen in hanging baskets include Lobelia, Petunia, Begonia, Marigolds, Fuchsias and Pelagoniums. The F1 varieties of these plants have a long flowering season making them ideal for summer hanging baskets. Obviously in any hanging basket, trailing plants add an extra interest. For example a variegated ivy helps to offset and provide a balance to the more colourful varieties. Try Primulas, Violas, pansies, miniature conifers, ornamental cabbage and cyclamen. All can offer a good season of winter colour at a time when it is most appreciated. 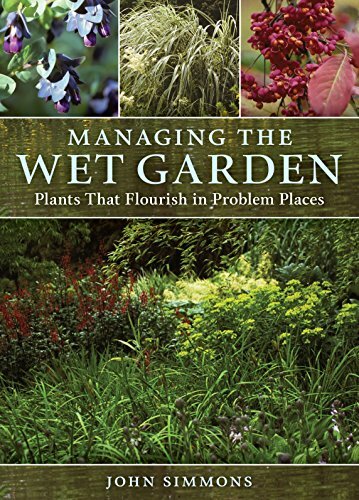 Previously we looked at plants for shady areas. Damp shade is another more specific problem area. 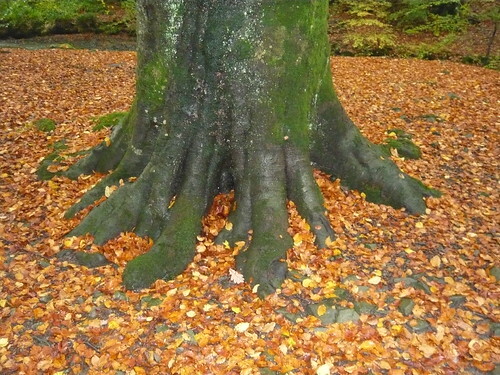 In nature, we are likely to get damp shade in a woodland setting, with a combination of shady tree growth and a peaty soil.There is a combination of low light and potentially wet surfaces. 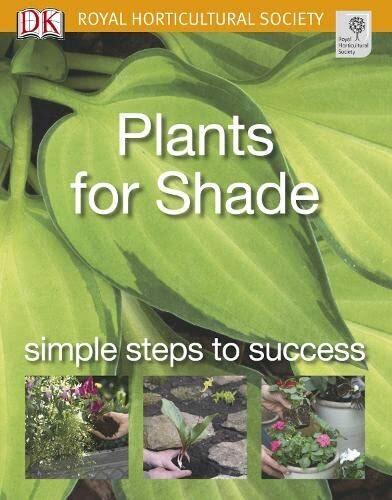 Nevertheless, even if you have some damp shade, the following plants should work quite well. Japanese Maple – Acer Palmatum. Japanese maples can offer excellent colour in autumn. 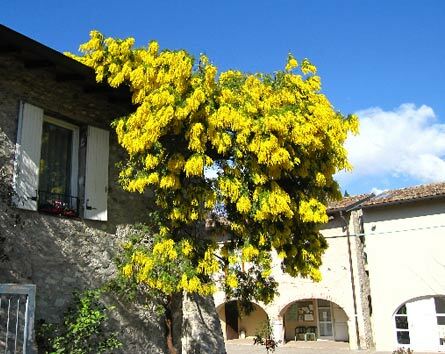 They also make an excellent small tree / shrub for the small garden. Benefits from some mulch in winter to protect from heavy frosts. Clematis ‘Kasmu’ Ideal for planting at the base of a shrub of tree. This clematis will grow up through the shrub offering wonderful flowers from July onwards. Clematis Montana – likes to keep its roots cool, so damp shade helps here.Use a good Foliar feed every 7-10 days and a good root drenching weekly. Fritilliary. The fritilliary is another flower which likes and needs a damp soil. Will flower fine in shade. Important it never dries out. Cowslips / Primulas. Primulas do well in cool damp conditions, flowering in spring and also later in autumn. E.g. Primula viallii is a great plant for damp shade with wonderful purple flowers.